Hello all! I am here today with my pastel mani for the instagram challenge being hosted by @thenailtrail. 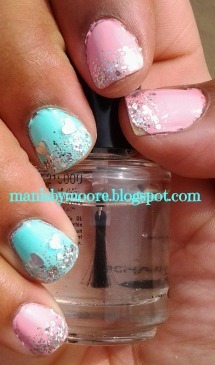 On one of the many blogs I follow the blogger used OPI Pink Friday. I have not used mine in a while so I decided to pull it out for this mani! I ended up picking this mani. I am so bad with rhinestones and studs. The hearts stuck out from the nail. I am worse than a kid! I have to pick at the things coming off my nails. I have been doing better at least I made it through the night and most of church before I started picking them. Are you a picker?? If you are how do you deal?? Thanks for stopping by! I always pick at things coming off my nails, too! I don't wear studs often, though, so it's not too much of a problem for me. The heart glitters look great! It is so good to know I am not the only one! Thank you so much!